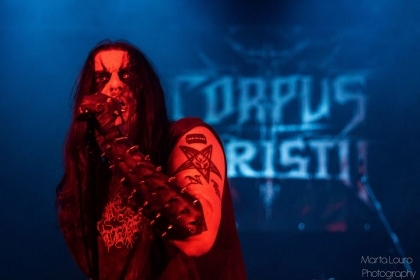 Last friday, Portuguese black metallers Corpus Christii premiered their latest album ''PaleMoon'' through an exclusive release gig at RCA Club in Lisbon, along with Neoplasmah and Infra. Here started a celebraton that will be carried out through an European tour which will start in a few days. Late was the hour at which Infra started playing. the death/black band featuring members of Göatfukk and Corpus Christii played for about half an hour, which seemed quite short a set for how good it was. Brutal, fast and dark as hell, with amazing work by all members who, regardless of the band itself being fairly recent, are not new in this in the slightest, and they knew what they're doing and they do it well. Everything about their performance was really good, and they certainly made a very good first impression to me as I haven't seen them before. So, the night started on a positive note, and it only went uphill from there, as the second band, Neoplasmah, took the stage. The band, who defined themselves as ''cosmic death metal'' are an absolutely amazing experience to witness, for their transcendental and un-traditional sound, and also the amazing vocal work by their lead singer Sofia, and, unlike many bands who rely solely on their female members to try to market their own success, Neoplasmah have no need for that, because everyone in the band does an excellent job and makes great music, and just like Infra, it was my first time seeing them, and I will definitely see them again. Now it was time for the headliners and hosts of the night, Corpus Christii, who were, as mentioned above, presenting their latest full length album ''PaleMoon''. Although their somewhat charismatic singer and leader Nocturnus Horrendus kept the usual stage antics to a surprisingly nearly non-existing minimum, that meant nothing as the anger and hate on his voice and attitude was palpable through the atmosphere into everyone who was present. Starting with ''Night of the Flaming Hatred'', followed by ''Crimson Hour'', and ''Crystal Glaze Foundation'', the first part of this 70 minute ceremony was only a dark and evil warm-up for the black metal attack we experienced that night. Apart from the quietness and stillness of the audience at the ''half-full-but-still-very-well-composed'' venue, which contrasted with the power emanating from the stage, be it from the guitarists, one of which is also Infra's bassist, and a member in countless other bands, which shows his versatility and skill, to the drummer who is also in another number of bands, to Nocturnus himself, this band is full of skillfull and competent people, and that night everything was on point and worked harmoniously. 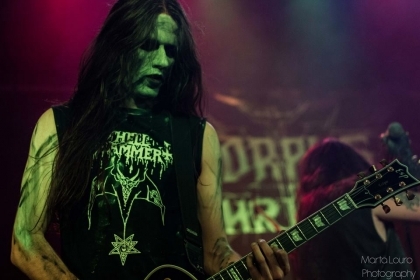 And so the gig went on with ''Last Eclipse'' and ''Evasive Contempt'' being some of the songs heard until the seemingly final song ''All Hail (Master Satan)'', but yet there was time for an encore, with ''The Fire God'', and with that came to an end this dark night of a pale moonlight.